U.S. stock futures for Monday, June 8, forecasted a 14-point decline from Friday's close. This morning, European markets were quite active as jitters over Greece's pending debt deal and growth in the U.K. economy. On Friday, the DJIA fell more than 54 points after the Bureau of Labor Statistics offered a rosy jobs report that has fueled increased speculation of a pending interest-rate hike by the Federal Reserve. The Stock Market Today: This morning, markets will continue to digest the possibility of a rate hike and this morning's jobs report. The Labor Market Condition Index, an unofficial report frequently cited by Fed Chair Janet Yellen, headlines a light economic calendar. Dollar Drama: The U.S. dollar is on the decline this morning after a report broke that President Obama said during the G-7 Summit that the "strong dollar posed a problem" for the global economy. The White House has denied the President made the comments. The administration said the President encouraged other G-7 members to use monetary policy to hike growth. Expensive Lunch: If you want to have lunch with investment legend Warren Buffett, it will cost you. Zhe Ye, the chairman of a Chinese gaming company, submitted the top bid in a five-day charity auction on eBay Inc. (Nasdaq: EBAY) to dine with the billionaire investor. Ye will pay $2,345,678 for the private lunch. Oil Outlook: Oil prices were on the decline this morning on news that OPEC will maintain its current production levels and China's economy is showing signs of continued weakness. WTI crude futures for July were down 0.4% this morning to hit $58.91 per barrel. Meanwhile, Brent oil was down 0.4% to hit $63.09 per barrel. Earnings Reports: Companies reporting earnings this morning include Vail Resorts Inc. (NYSE: MTN), Walter Energy Inc. (NYSE: WLT), H&R Block Inc. (NYSE: HRB), and Dave & Buster's Entertainment Inc. (Nasdaq: PLAY). Pre-Market Movers No. 1, DEO: Shares of Diageo plc (ADR) (NYSE: DEO) slipped more than 2% in premarket hours after speculation continues on whether a Brazilian billionaire may soon takeover the company. News broke Friday that buyout firm 3G is considering a deal for U.K. spirits maker. 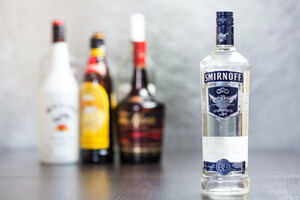 The firm's brands include Captain Morgan rum, Smirnoff vodka, and Johnnie Walker whiskey. Pre-Market Movers No. 2, SHLD: Shares of Sears Holdings Corp. (Nasdaq: SHLD) were up more than 2.5% this morning on news that the department store chain had reported a smaller loss in the March-ending quarter than previously expected. The firm also announced that it will likely raise $2.6 billion as it plans to spin-off more than 200 store locations into a real estate investment trust (REIT). Pre-Market Movers No. 3, PANW: Shares of Wal-Mart Stores Inc. (NYSE: WMT) were up more than 0.5% this morning after the company received an upgrade from Raymond James Financial, Inc. (NYSE: RJF). The financial brokerage said that it has raised its price target for the global retailer to $86, an 18% premium over current price levels. Over the weekend, the company's founding family, the Waltons, cemented their grip on the firm's corporate board after fending off challenges from investors to dilute shareholdings and appointing Sam Walton's grandson-in-law as its new chairman. Stocks to Watch No. 1, BABA: Shares of Alibaba Group Holding Ltd. (NYSE: BABA) were up marginally on news that the company's cloud-computing division Aliyun has launched the "Marketplace Alliance Program." The program is designed to partner with Intel Corp. (Nasdaq: INTC) and other major telecom and technology firms to localize cloud services across multiple regions around the world. Stocks to Watch No. 2, MON: The incredible wave of M&A speculation continued over the weekend. Swiss agricultural giant Syngenta AG (ADR) (NYSE: SYT) announced it has rejected another significant offer – up to $45 billion – from seed and chemical giant Monsanto Co. (NYSE: MON). A deal between the two would likely face regulatory scrutiny given the size and global reach of the new company. But the real holdup if a deal were to ever get done would likely be from farmers, who might raise serious concerns about Monsanto's company practices. Stocks to Watch No. 3, AAPL: Tech giant Apple Inc. (Nasdaq: AAPL) kicks off its annual developers conference today in San Francisco. This week the company is expected to unveil a new music streaming service. In addition, the firm will release a new development kit that allows software engineers to create new applications for its new Apple Watch.